Blowout Sale! 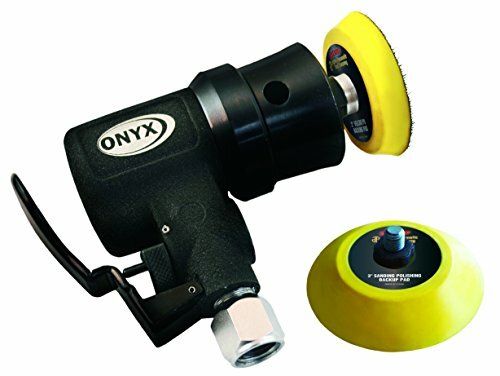 Save 51% on the Astro 321 ONYX Random Orbit Micro Sander with 3mm Orbit by Astro Pneumatic Tool at Road compass. MPN: 321. Hurry! Limited time offer. Offer valid only while supplies last. The Astro 321 ONYX Random Orbit Micro Sander - Velcro - 3mm Orbit is the smallest and most powerful sander in its class - boasting a 0.4 HP rating. The Astro 321 ONYX Random Orbit Micro Sander - Velcro - 3mm Orbit is the smallest and most powerful sander in its class - boasting a 0.4 HP rating. Featuring the latest technology in ultra-compact machined internals, this sander is ideal for spot sanding focus areas. The Micro design makes it perfect for reaching smaller areas and tighter contours with less user fatigue. Full length with pad of 4.3"; Includes 2" (20301P) and 3" (20302) PU Velcro backing pads.Specifications:Pad Size: 2" (also works with 3")Spindle: 5/16" - 24 (Female)Orbit Diameter: 3mmFree Speed: 16,000RPMAir Consumption: 3.1CFMAir Inlet: 1/4"Motor: 0.4HPPressure (bar): 90psiExhaust: SideWeight: 1.34lbsLength: 4.3".